The first thing visitors notice about the sertao, Brazil's dry outback, is the heat: it seems enough to keep anyone focused on where their next drink's coming from. But local cowboys have a different concern: the sertao's spiny vegetation. Known as caatinga, it is decent fodder for cows and goats, but ferociously inhospitable to human clothes and skin. So, while many in the region are inseparable from their parasols, cowboys can be found dressed head-to-toe in protective leather. They know it is better to get very hot than wholly perforated. 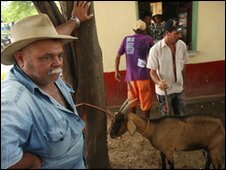 Smallholder Eduardo Araujo and his farmworker Antonio are in search of miscreant goats. Like many local farmers, they let their herds graze freely over their neighbours' land (the caatinga seems inexhaustible). But when the animals need rounding up, the leather quickly comes out. The two men equip themselves with boots, trousers, waistcoats, jackets, and caps, and head out into the evening. Somehow the men's horses, themselves fitted with leather breastplates, don't buckle under the weight. An hour later, the goats are duly penned, although in the meantime one of the farm's donkeys has fled into the bush to (probably temporary) freedom. "For me, this is the best sport there is," says Mr Araujo. "It's a pleasure to work with the animals, to give them food and antibiotics, [to feel] that they depend on humans just as we depend on them." This is the image of the north-eastern cowboy: the hero of the sertao, eschewing the delights of the Brazilian coastline and choosing instead to tame the barren interior. It's a life that is celebrated by the Catholic Church through the annual Cowboys' Mass, as well as by local authorities. While Rio de Janeiro has its famous Sambadrome, the sertaneja city of Petrolina takes pride in the stews and grills of its publicly-built Goat-drome. The cowboy's life has also been etched in Brazil's national consciousness through the art and poetry of the cordel: flimsy pamphlets of rhyming verse which reached tens of millions of Brazilians in the early 20th Century and which are still sold today. 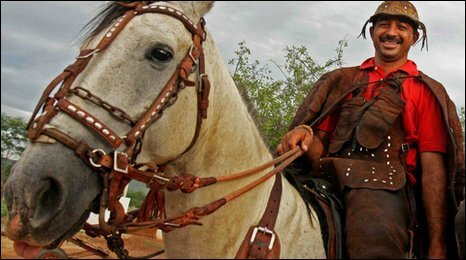 Countless cordeis feature cowboys braving the heat and exoticism of the sertao. The only other figures to receive such attention are the bloody sertao bandits of the 1920s and 1930s. The most renowned of them, Lampiao, is reputed to have used pieces of caatinga to pierce his enemies' eyes. Yet if the history of the sertanejo cowboy seems romantic, it shouldn't. "Life was hard, very hard," says J Borges, the most famous modern-day cordel poet. "I prefer the north-east as it is today. It's more democratic." At a cattle market in the town of Serra Talhada, cowboy Genesio Valeriano agrees with Mr Borges. "When we were children, we didn't have electricity or a fan. 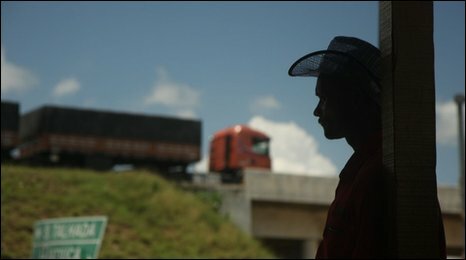 All the work used to be by hand," he says, explaining why eight of his nine siblings migrated south to the industrial hub of Sao Paulo. Today those siblings and their children see the sertao simply as a horse-riding retreat. But for Mr Valeriano, the land remains something more. "Now we have machines, we have electricity. Life here is getting better. It's sweat and toil, but you get used to that and come to like it." As the cowboys have endured, they have had to evolve. Eduardo Araujo himself is a sign of the times: he works the land that once belonged to his great-grandfather, but combines it with other jobs in the nearby town of Lagoa Grande. "[The livestock alone] isn't not enough. The income is small. So I help out at my wife's clothes shop, doing the bureaucratic things, and I drive a bus." He later admits to also having trained as a nurse after having cared for his sick father. How does he manage such different trades? "It's a Brazilian knack," he says. This hints at the sertao's problem: for all the cowboys' perseverance, Brazil has many more productive areas for livestock. There is no shortage of land in the sertao - indeed, among the caatinga bush, drug traffickers have found room to create Brazil's biggest area of marijuana production - but sometimes it seems hardly worth tending. Rafael Fernandes, the local agriculture secretary in Serra Talhada, remains defiant: "You can't leave an area like this to become a desert. What would small producers do?" In his office, and across the sertao, plans are being hatched to ensure that the cowboy of the north-east doesn't become an extinct breed. The most recent hopes are in fact returns to past successes: cotton and the railway. Mr Fernandes remembers dozens of cotton trucks leaving the area each week during his childhood. He hopes that the current biodiesel boom will revive cotton cultivation in Serra Talhada, thereby supplementing cowboys' income. The national government also plans to rebuild a north-eastern train line, providing cheap transport to the coast. For Mr Fernandes as for many, the timeworn images of the Brazilian backlands can still hold true.